Xandra Yantzi once got a standing ovation in third grade just for making it down the basketball court without travelling or losing the ball. 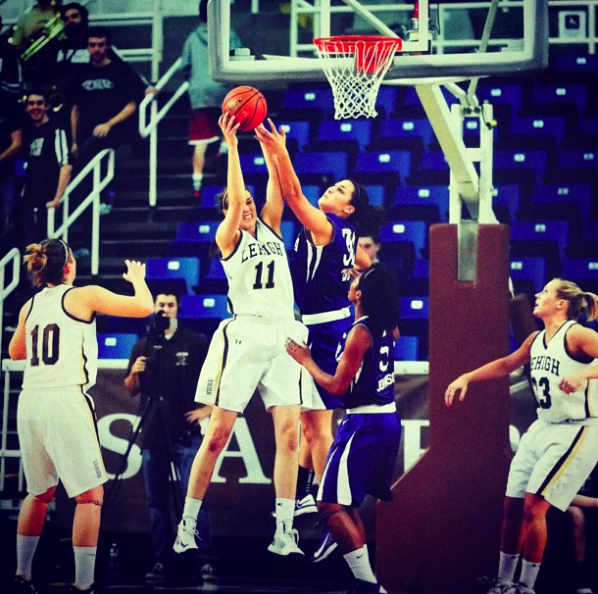 She suspects her height kept her in those early games, but it was perseverance and hard work that got her into Lehigh University, where she played four years of Division 1 ball with the NCAA. At Lehigh she developed as an athlete and got to know herself better. It was there that she came out to someone for the first time—a teammate she had a crush on—to a less-than-enthusiastic response. Now Xandra is out, proud and a force to be reckoned with. She’s a French immersion teacher and a spoken word artist. She lives with type 1 diabetes. She’s also a basketball coach to a team of girls who range from ages 10-12. Xandra sat down with me to talk about her coming out experience, the responsibility of shaping young athletes, and more! Can you tell about coming out to your teammate? Hearing those little conversations and interactions pushed me away from feeling comfortable. Like eh? Maybe I don’t need to explore this. I regret how I went about telling my teammate I was attracted to her. As a person, I try to be really reflective on how I do things, how I treat others, and the consequences of my intentions. She clearly wanted nothing else to do with me, and then the girls on my team were split. Unfortunately a lot of people gravitated to this other teammate. Having that one relationship ruined, it kind of ruined a lot of other relationships with the team too, which was hard. It took me a whole other year to even consider telling my family. But I did and they are incredible about it. Was it tense in the locker room after that? Even the idea of being in the same room, like sleeping arrangements, was made awkward too. Which was frustrating, right? Because it goes to show society's ideas of consent and that culture and understanding… Which is a whole other add to that. Was that the first time your sexuality intersected with your athletic career? I think the reason that I grappled so long with my sexuality was that I was afraid I was falling into the gay basketball stereotype. I read this ridiculous article about how players in the WNBA are fearful that it’s becoming an LGBT league. And people are fearful that coming into the WNBA means that they will suddenly be attracted to women. The misconceptions and blatant ignorance is frustrating to say the least. I think about how now, in high schools and elementary schools there are GSAs. Gender and sexuality are actually talked about. I don’t remember ONCE in my whole high school or elementary career that it was discussed. Ever. I think about it often. I try to talk about it with my kids, I try to get it in there somewhere. Speaking of your kids, let’s talk about your coaching experiences! I love coaching—from a player’s standpoint, I know I wouldn’t be the person that I am today had I not had the coaches that I had. I think sport has always been something that goes much further than the game. You learn how to work with other people. Time management. Prioritizing. I think it’s overlooked sometimes—being able to work with diverse people and be accepting, even beyond, is a beautiful part of team sports. What are some of the values you instill in your athletes? With my team, we spend a lot of time talking about toughness. What is toughness on a basketball court? It’s not as much about physical strength or aggressiveness. Instead, it’s about the bigger, universal ideas. Running over and helping somebody if they’re on the floor. Sportsmanship. The idea of community. We’re also trying to create an environment where mistakes are allowed. I have girls who come in and the idea of making a mistake is terrifying. It’s really nice, you try to create this environment where good mistakes are actually encouraged. So when you make mistakes, you know you dribble that ball off your foot because you’re dribbling too hard? Perfect. Or if you’re dribbling a little softer and you lose the ball because that level is pushing yourself out of your comfort zone, fantastic! I coach because I love the sport. I can definitely help girls develop. I’ve have amazing experiences and opportunities that I would feel bad if I wasn’t giving back to what so many coaches gave me. I would not be where I am today if it hadn’t been for basketball and the amazing coaches I’ve had. I know a lot of these girls will not be pro basketball players. The idea is that sports and basketball can foster the idea of good self esteem. It can foster good work ethic. I’m trying to, at the same time [teach them more]—young girls have questions. How do you answer that question? You could talk about culture. You could talk about opportunity. I decided to talk to them about at one point in time, black people were not allowed to play in the NBA. And that equal opportunity and equity were not widely known ideas. I talked to them about the 1966 Miners. I don’t expect my girls to be able to grasp all these ideas immediately. But maybe, there’ll be a day when one of the conversations they had when they were playing with me—they’ll be able to apply it. They’ll be able to listen and learn from perspectives or experiences that aren’t their own. Check back soon for Part II of Xandra’s interview, when we talk encouraging young girls to embrace sports, making athletics more inclusive, and her best basketball advice.